Now six months in, the 2018 edition of PAPER’s annual Tracing PAPER mentorship scheme is well underway, with 10 selected North West based artists developing new work ready to present at PAPER from 30 June to 11 August. Here we home in on their various, notably diverse practices for a brief overview ahead of the forthcoming Summer exhibition. The complete abundance of images that now dominates our lives (both on and offline) has become a point of creative interest for many artists working today, including several of this year’s Tracing PAPER cohort. Tina Dempsey’s playfully abstract paintings, collages, sculptures and prints respond to the numbing effect of this state of over-saturation by deconstructing and reassembling images from the world around us; stripping them of their everyday associations and inviting the viewer to re-engage or ‘look afresh’. David Penny, on the other hand, manages to cut through the ephemeral, cluttered nature of the modern visual landscape with his still life photographs, prints and installations, which carry a marked silence and weightiness to them; forcing us to slow our process of looking. He often focuses on objects, spaces and surfaces that could be easily overlooked, highlighting their inherent aesthetic quality and granting a particular sense of presence; whilst also exploring the material status of the photographic medium or image itself. Moving from the frequent ubiquity of the reproducible photograph to the unique, meditative space of drawing, William Hughes takes fragments of found images from a variety of sources (manuals, books, found photo albums, the internet) and converts them into semi-dream-like graphite renderings that carry a similar quality of weight and inertia to Penny’s work. Jack Brown’s interests also lie with the easily overlooked or seemingly banal objects and moments that make up life; amplifying small details that, once noticed, are often found to contain kernels of surprising humour, beauty or human narrative. His work straddles multiple mediums, from sculpture, video and drawing (read about his performative piece included in the PAPER exhibition, For Space, here), to instruction, pedagogy and group collaboration. Complementing Brown’s emphasis on acute observation and the grounding impact that this entails, Niki Colclough is a socially-engaged artist who uses multiple methods to explore a sense of belonging and connection. A series of colourful, abstract watercolours respond to conversations between Colclough and patients at Manchester’s Royal Infirmary, conveying an almost tangible sense of feeling and intuitive expression. While a number of other, drawing-based pieces seem to emerge simply from ‘moments’ – experiences in time and space translated into shape and colour. Ruth Murray’s work is similarly driven by feeling and sensation; yet the atmosphere here is more centred towards tension and unease. Her vividly coloured paintings are nearly all based on images of girls or young women, engaged in scenes that Murray stages, directs and photographs herself. A sense of mystery and collusion is often rife as the viewer receives only glimpses of a physiological-inner world that cannot be entered by anyone else. While Murray is perhaps the most figurative of this year’s Tracing PAPER artists, Iain Andrews’ work hovers enigmatically in the space between figuration and abstraction, often taking well-known scenes and narratives from art history and reworking them with his own visceral, painterly language and playful sensibility. Lifted from their mythical, historic or folkloric origins, characters often look disorientated and quizzical in their new surroundings; or else, strangely frozen within undecipherable moments of high drama. The colours and styles of each piece form strange fusions of old and new, challenging preconceptions around contemporary art and highlighting the mutability of subject matter. Continuing the theme of place that is present across several of the artists’ work, David Armes experiments with alternative modes of spatial representation through methods such as automatic writing, anonymous conversations and oral history. Distilled into works on paper using a letterpress technique, these experiential source materials become the basis for schematic, text-based images, providing an unusual ‘portrait’ of what it feels like to occupy a particular landscape or (non)location, rather than simply view it from a removed position. Oliver Binnian predominantly deals with landscapes as well, though, in his case, the interest lies more with the strange, perhaps unsettling way in which we are now able to instantly experience almost any place in the world without actually inhabiting it. 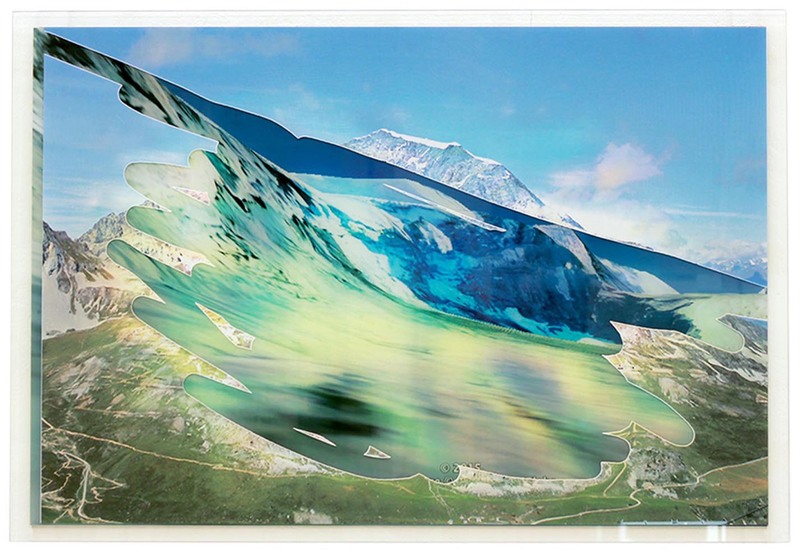 Tools such as Google Earth and other digital simulacra offer innumerable views of exotic jungles or distant mountain tops, yet these images often have a dissatisfying quality to them, leaving the viewer ever-hungering for more. Binnian’s own work heightens this feeling by adopting a hyperreal yet insubstantial aesthetic, whilst occasional visual interventions or disruptions emphasise as sense of vulnerability, as if each image could dissolve into a thousand pixals at any moment. From the hyperreal to the surreal, musician and visual artist Ruby Tingle uses paper, found images, materials and objects in her work to create fantastical images that blur the boundary between humans and other animal; often leading to strange hybrid creatures derived from her own alternative folklore. Tingle has also more recently begun incorporating elements of self-portraiture within her drawings and collages, as a way of documenting the multiplicity of inner experience whilst exploring her own private mythology. Altogether, the 2018 Tracing PAPER artists appear to form a richly matched group. It will be fascinating to see how this sustained, nine-month period of studio visits, critical feedback, peer support and one-on-one mentorship will shape their individual practices going forwards.